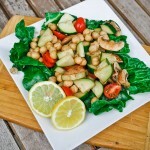 A delicious side dish any time of year! Mashed potatoes have always been one of my favorite foods. I don’t know what it is about them, but they are just so nice and soft and starchy and delicious. They are also one of the first things I learned how to cook, and they’re super easy to make. The hardest part is peeling the potatoes, which you don’t even have to do if you like the skins in there, and which is pretty fast once you get the hang of it – just make sure you use a good peeler and it’s no sweat. You can use a potato masher, a hand mixer, a food mill, or even an immersion blender – they all work great, it just depends on what consistency you want. Or which one you have laying around the house, in my case. I tend to go with a hand mixer, but mashed potato purists will say that that actually makes them “whipped potatoes.” Whatever you use, just add a bit of oil (I use a neutral canola or safflower oil) to coat them and then a bit of milk substitute of your choice – I recommend either soy or rice milk, I’ve tried it with almond and it gives the potatoes an almond-y flavor I didn’t really like. The more milk you add, the softer the potatoes will be. In this case, I was going for a slightly more chunky potato, but if I’d cooked them longer or added more milk these same ones could have been nice and smooth. You can also add salt, pepper, onion or garlic powder, or if you want to make garlic mashed potatoes just peel about 10-20 cloves of garlic (yes, that sounds like a ridiculous amount of garlic. 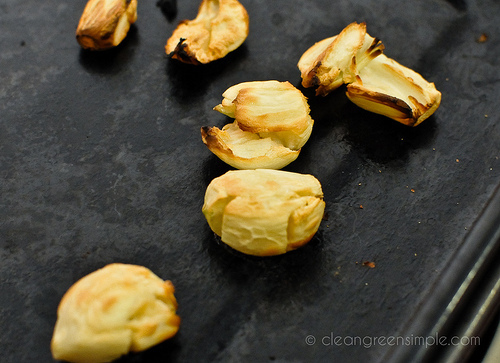 Don’t worry, I haven’t completely lost touch with normal human taste buds yet – roasting it makes it much milder), roast them in the oven for about 5 minutes until they are just starting to brown, and then toss them in and mash them along with the potatoes. So easy, so delicious. I know mashed potatoes aren’t really something most people think of as a “beginning of summer” food, but I can pretty much eat them any time. 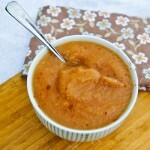 Plus, mashed potatoes, coleslaw, and corn on the cob make an excellent set of picnic or BBQ side dishes! Add potatoes to boiling water, and let boil for 10-20 minutes, until soft and easily pierced with a fork. Drain and rinse. If you are making garlic mashed potatoes, preheat the oven to 400 degrees, place your garlic on a cookie sheet, and roast it for about 2 minutes, flip the cloves, and roast for another 2-3 minutes, until lightly browned. 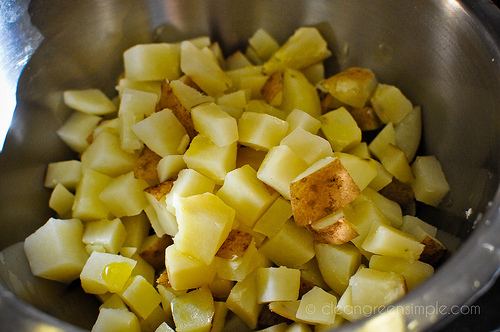 Transfer potatoes to a large mixing bowl and add oil (and garlic cloves, if using). Mix, mash, or blend - whichever tool you prefer. Once they are somewhat mashed and coated with the oil, add the milk a little at a time as you blend until the desired consistency is reached. Serve with gravy or just as they are. Oh my gosh, and they are GARLIC mashed potatoes to boot! I’ll definitely be making these this week. Also, Tom and I made your walnut pesto (except we did pecans) over Memorial Day weekend and it was absolutely delicious. Definitely a keeper! My hubby is an avid mashed potatoes guy so this will be a nice surprise meal for him. Thanks for sharing! 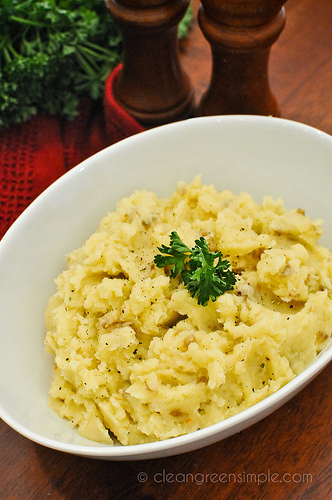 Coming from a family who grew up on a farm…mash potatoes were a staple! LOVE THEM! Nowadays I make them veganlike with earth balance and soy…still amazing. 🙂 I need to add roasted garlic, that sounds like it would kick up the flavor! Oh my gosh. I LOVE YOU!!!! I am lactose intollerant, so this is AMAZING!!! Thank you! When my kids want cheesy mashed potatoes or twice baked potatoes I add a little chicken broth and nutritional yeast. If you are vegetarian the nutritional yeast gives a nice cheesy flavor, and the chicken broth can be omitted. I also think yukon gold are the best for the mashed potatoes. 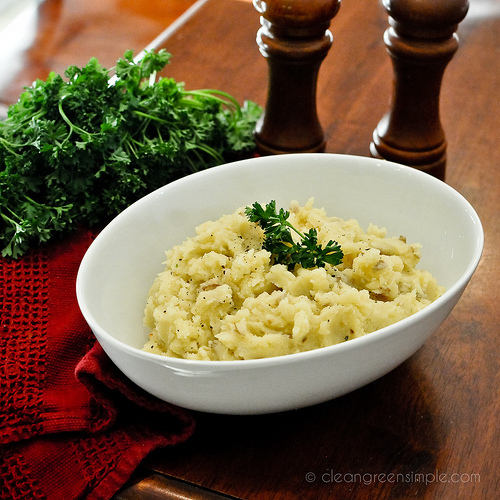 Another great way to make delicious potatoes without dairy in it is to mash them with fried white onions. try using almond milk instead of soy. The soy is bad for your thyroid. Glad I found some comments on how soy or rice milk will work in mashed potatos. My son has a severe dairy allergy and I didn’t know how milk substitutes will affect the creaminess or the taste. Sounds like it’ll be just fine 🙂 So glad I found this recipe. Now I’m going to try it for myself. Just a suggestion… some of your ingredients are not healthy. I would not use canola oil, soy oil, or rice oil. They are a GMO product and are extremely unhealthy. It is important with all of those oils to buy organic because then they are not GMO – if they are not organic the odds are quite high that they will be GMO, you are correct! Thanks for this recipe! I have a dinner guest this weekend who is allergic to dairy and i was going to make shepherd’s pie. I wanted to point out that an organic label DOES NOT guarantee that the product is non-GMO. This is a very common misconception. Also, there have been many, many studies done on the health effects of GMO food, and none have shown them to be any better or worse for you than any other non-GMO food. Especially with oils…with fresh fruits and veg there may be concern over pesticide or herbicide residues, but with oils they go through so many processing steps that you won’t have that issue.